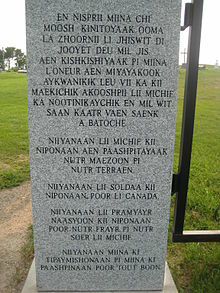 Michif (also Mitchif, Mechif, Michif-Cree, Métif, Métchif, French Cree) is the language of the Métis people of Canada and the United States, who are the descendants of First Nations women (mainly Cree, Nakota, and Ojibwe) and fur trade workers of European ancestry (mainly French and Scottish Canadians). Currently, Michif is spoken in scattered Métis communities in the provinces of Saskatchewan and Manitoba in Canada and in North Dakota in the U.S., with about 50 speakers in Alberta, all over age 60. There are some 230 speakers of Michif in the United States (down from 390 at the 1990 census ), most of whom live in North Dakota, particularly in the Turtle Mountain Indian Reservation. There are around 300 Michif speakers in the Northwest Territories, northern Canada. Michif emerged in the early 19th century as a mixed language (not to be confused with a creole), and adopted a consistent character between about 1820 and 1840. Michif combines Cree and Métis French (Rhodes 1977, Bakker 1997:85), a variety of Canadian French, with some additional borrowing from English and indigenous languages of the Americas such as Ojibwe and Assiniboine. In general, Michif noun phrase phonology, lexicon, morphology, and syntax are derived from Métis French, while verb phrase phonology, lexicon, morphology, and syntax are from a southern variety of Plains Cree. (Plains Cree is a western dialect of Cree.) Articles and adjectives are also of Métis French origin but demonstratives are from Plains Cree. The Michif language was first brought to scholarly attention in 1976 by John Crawford at the University of North Dakota. Much of the subsequent research on Michif was also related to UND, including four more pieces by Crawford, plus work by Evans, Rhodes, and Weaver. The Michif language is unusual (and possibly even unique) among mixed languages, in that rather than forming a simplified grammar, it developed by incorporating complex elements of the chief languages from which it was born. French-origin noun phrases retain lexical gender and adjective agreement; Cree-origin verbs retain much of their polysynthetic structure. This suggests that instead of haltingly using words from another's tongue, the people who gradually came to speak Michif were fully fluent in both French and Cree. The number of speakers is estimated at fewer than 1,000; it was probably double or triple this number at the close of the 19th century, but never much higher. Michif as recorded starting in the 1970s combined two separate phonological systems: one for French origin elements, and one for Cree origin elements (Rhodes 1977, 1986). For instance, /y/, /l/, /r/ and /f/ exist only in French words, whereas preaspirated stops such as /ʰt/ and /ʰk/ exist only in Cree words. In this variety of Michif, the French elements were pronounced in ways that have distinctively Canadian French values for the vowels, while the Cree elements have distinctively Cree values for vowels. Nonetheless, there is some Cree influence on French words in the stress system (Rosen 2006). But by the year 2000 there were Michif speakers who had collapsed the two systems into a single system (Rosen 2007). Michif has eleven oral vowels and four nasalized vowels. A schwa /ə/ appearing between two consonants in French-origin words is dropped in Michif. Examples of this process are listed in the table below. The voiced alveolar stop /d/ in French-origin words is palatalized to /dʒ/ in Michif, as it is in Acadian French. This may occur word-initially or word-internally. Nouns are almost always accompanied by a French-origin determiner or a possessive. Cree-origin demonstratives can be added to noun phrases, in which case the Cree gender (animate or inanimate) is that of the corresponding Cree noun. Adjectives are French-origin (Cree has no adjectives), and as in French they are either pre- or postnominal. Prenominal adjectives agree in gender (like French), however, postnominal adjectives do not agree in gender (unlike French). The verb phrase is that of Plains Cree-origin with little reduction (there are no dubitative or preterit verb forms). Michif word order is basically that of Cree (relatively free). However, the more French-origin elements are used, the closer the syntax seems to conform to norms of spoken French. Toñ Periinaan, dañ li syel kayaayeen kiichitwaawan toñ noo. Kiiya kaaniikaanishtaman peetoteiie kaandaweetaman taatochiikateew ota dañ la ter taapishkoch dañ li syel. Miinaan anoch moñ paeñiinaan poneeiiminaan kamachitotamaak, niishtanaan nkaponeemaanaanik anikee kaakiimaiitotaakoyaakuk kayakochii'inaan, maaka pashpii'inaan aayik ochi maachiishiiweepishiwin. Answichil. Notre Père, qui est aux cieux, Que ton nom soit sanctifié, Que ton règne vienne, Que ta volonté soit faite Sur la terre comme au ciel. Donne-nous aujourd’hui notre pain de ce jour Pardonne-nous nos offenses, Comme nous pardonnons aussi à ceux qui nous ont offensés, Et ne nous soumets pas à la tentation, Mais délivre-nous du mal. Ainsi soit-il. Our Father, who art in Heaven, Hallowed be thy Name. Thy Kingdom come. Thy will be done, on earth as it is in Heaven. Give us this day our daily bread. And forgive us our trespasses, As we forgive those who trespass against us And lead us not into temptation; But deliver us from evil. In languages of mixed ethnicities, the language of the mother usually provides the grammatical system, while the language of the father provides the lexicon. The reasons are as follows: children tend to know their mother’s language better;[dubious – discuss] in the case of the Métis, the men were often immigrants, whereas the women were native to the region. If the bilingual children need to use either of their parents’ languages to converse with outsiders, it is most likely to be the language of their mothers. Thus, the model of language-mixing predicts that Michif should have a Cree grammatical system and French lexicon. However, in reality, Michif has Cree verb phrases and French noun phrases. The explanation for this unusual distribution of Cree and French elements in Michif lies in the polysynthetic nature of Cree morphology. In Cree, verbs can be very complex with up to twenty morphemes, incorporated nouns and unclear boundaries between morphemes. In other words, in Cree verbs it is very difficult to separate grammar from lexicon. As a result, in Michif the grammatical and bound elements are almost all Cree, and the lexical and free elements are almost all French; verbs are almost totally Cree, because the verb consists of grammatical and bound elements. Seen in this way, it can be argued that Michif is fundamentally Cree, but with heavy French borrowing (somewhat like Maltese, a mixed Arabic-Italian language classified as fundamentally Arabic). Métis cultural centres such as the Michif Cultural and Métis Resource Institute in St. Albert, Alberta, the Métis Culture and Heritage Resource Centre in Winnipeg, and the Gabriel Dumont Institute of Native Studies and Applied Research are attempting to revive the language through public outreach. As of 2013, the Northern Journal reports that "Aboriginal language and culture is becoming increasingly visible" in Alberta, as Alberta's Northland School Division, "serving mostly First Nations and Métis students in the northern part of the province" has expanded its community partnerships and culture camps. ^ Hammarström, Harald; Forkel, Robert; Haspelmath, Martin, eds. (2017). "Michif". Glottolog 3.0. Jena, Germany: Max Planck Institute for the Science of Human History. ^ Ma, Kevin (2013-03-13). "Researcher digs into near-extinct Métis language". St. Albert Gazette. Retrieved 2013-03-24. ^ L. Lee Scott (2007-07-02). "The Turtle Mountain Michif: A People and Their Language". Yahoo! Voices - voices.yahoo.com. Archived from the original on 2014-07-29. Retrieved 2013-03-24. ^ Michif: A new language. North Dakota English 4.1:3-10. ^ Bakker, P. 1997. A Language of our own. The genesis of Michif, the mixed Cree-French language of the Canadian Métis. Oxford, Oxford University Press. ^ Rosen, N. 2007. Domains in Michif phonology. PhD thesis, University of Toronto. ^ Papen, R. 2003. 'Michif: One phonology or two? ', in Y. Chung, C. Gillon, and Wodjak (eds) Proceedings of the Eight Workshop on the Structure and Constituency in Languages of the Amnericas, University of British Columbia Working Papers in Linguistics 12, p.47-58; Papen, R. 2014. 'La liaison en mitchif : un cas d’acquisition incomplète fossilisée?' in C. Soum-Favaro, A. Coquillon and J.-P. Chevrot (eds. ), Liaison : Approches contemporaines. Berlin, Peter Lang, p. 213-238. ^ Taken from: Redish, Laura and Orrin Lewis. "Vocabulary Words in Native American Languages: Michif". Native-Languages.org. Retrieved 2007-08-08. ^ Bakker, Peter. A Language of Our Own: The Genesis of Michif, the Mixed Cree-French Language of the Canadian Metis, Oxford University Press, 1997. ^ "Overview of the Curriculum and Publishing Department". Gabriel Dumont Institute. Retrieved 2013-03-24. ^ Renée Francoeur (2013-03-12). "Northland improves use of Aboriginal languages". Northern Journal. Retrieved 2013-03-24. Bakker, Peter. 1997. A language of our own: The genesis of Michif, the mixed Cree-French language of the Canadian Métis. New York, Oxford University Press. Bakker, Peter and Robert Papen. 1997. Michif: A mixed language based on Cree and French. In S. Thomason (ed.) Contact languages: A wider perspective. Philadelphia: John Benjamins, p. 295-363. Bloomfield, Leonard (1984) Cree-English Lexicon Human Area Relations Files, New Haven, CT.
Evans, Donna. 1982. "On coexistence and convergence of two phonological systems in Michif." Work Papers of the Summer Institute of Linguistics, University of North Dakota Session, 26, p. 158-173. Fleury, N. and L. J. Barkwell. 2000. La Lawng: Michif Peekishkwewin: The Canadian Michif Language Dictionary. Winnipeg: Metis Resource Centre. Gillon, Carrie and Nicole Rosen. 2016. Critical mass in Michif. Journal of Pidgin and Creole Languages 31: 113-140. Papen, Robert. 2003. "Michif: One phonology or two?" In Y. Chung, C. Gillon and R. Wokdak (eds) University of British Columbia Working Papers in Linguistics, Vol. 12, Proceedings of the Eighth Workshop on Structure and Constituency in Language of the Americas, p. 47-58. Papen, Robert. 2004. "Michif spelling conventions: Proposal for a unified Michif writing system. In L. Barkwell (ed.) La lawng: Michif peekishkwewin. Winnipeg, MB: Pemmican Publications, p. 29-53. Rhodes, Richard A. 1977. French Cree—a case of borrowing. Actes du Huitième Congrès des Algonquinistes. Wm. Cowan (ed. ), Ottawa: Carleton University. p. 6-25. Rhodes, Richard A. 1986. Métif—a second look. Actes du Septième Congrès des Algonquinistes. Wm. Cowan (ed. ), Ottawa: Carleton University. p. 287-296. Rhodes, Richard A. 1987. Les Contes Metif—Metif Myths. Papers of the Eighteenth Algonquian Conference. Wm. Cowan (ed. ), Ottawa: Carleton University. p. 297-301. Rhodes, Richard A. 1992. Language Shift in Algonquian. International Journal of the Sociology of Language. 93:87-92. Rhodes, Richard A. 2001. Text Strategies in Métchif. Papers of the Thirty-second Algonquian Conference. H. C. Wolfart (ed. ), Winnipeg: University of Manitoba. p. 455-469. Rosen, Nicole. 2006. Language Contact and Stress Assignment. Sprachtypologie und Universalienforschung. 59:170-190. Rosen, Nicole. 2007. Domains in Michif Phonology. Ph.D. Thesis. Department of Linguistics. University of Toronto. Papen, Robert. 2005. Le mitchif: langue franco-crie des Plaines. In A. Valdman, J. Auger & D. Piston-Hatlen (eds). Saint-François, QC: Presses de l'Université Laval, p. 327-347. Weaver, Deborah. 1982. Obviation in Michif. Work Papers of the Summer Institute of Linguistics, University of North Dakota Session, 26, p. 174-262. Weaver, Deborah. 1983. The effect of language change and death on obviation in Michif. In W. Cowan (ed.) Actes du Quatorzième Congrès des Algonquinistes. Ottawa: Carleton University Press, p. 261-268. Zoldy, Grace. 2003. The Lord's Prayer. In Li Liivr Oche Michif Ayamiiawina - The Book of Michif Prayers. Camperville Michif Cree Ritual Language Project. For a list of words relating to Michif, see the Michif category of words in Wiktionary, the free dictionary. This page was last edited on 17 April 2019, at 21:19 (UTC).